This 1700 book by Dr. John Jones attempts to guide the caution of that prudent hand, separating myth from truth, and shedding the Light from God (A Deo Lux) onto the murky therapeutics of a dangerous substance. 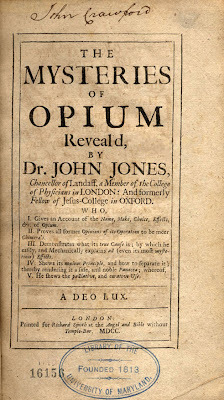 Jones cites the ill effects of opium as "Nauseas, Vomitings, which are generally very dismal, with great distress, and sometimes dangerous ; Swimming in the head, Hiccoughs, Distresses, Anxieties, Convulsions, Faintings, Leipothymies, Syncopes, &c." Attempting to debunk previous misconceptions, Jones states that the trick to successful administration of opium is in its preparation. One must be extremely careful to separate off its "Earthy or Phlegmatick parts." In particular, he blames the "Rosin" for being the chief source of the drug’s dangerous narcotic tendencies. 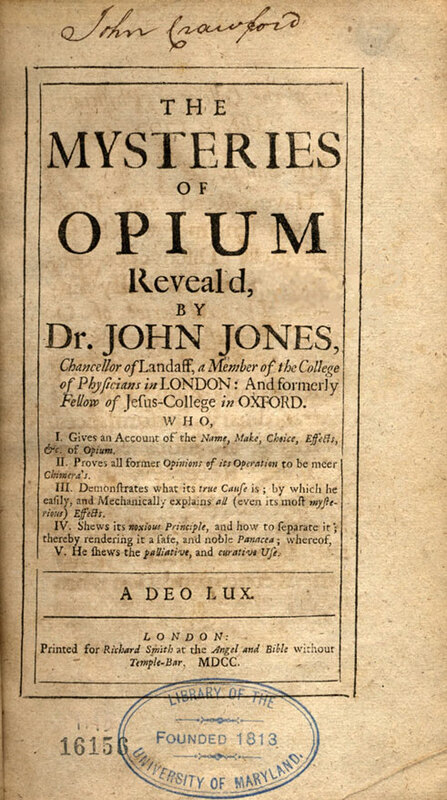 In other words, Jones will have us believe that one need not fear the ingestion of opium, so long as its composition and dosage are correctly proportionate.